An informative and historical overview of Cooper County, Missouri including four separate books on one CD which include 5 historical maps (1851, 1902, 1913, 1920's and 1929: these 5 maps show a total of 29 different communities); plus the full 1883 National Historical Company History of Cooper County, Missouri book (583 pages of history with over 375 different family biographies); plus the full two volume 1919 Historical Publishing Company History of Cooper County, Missouri book (1167 pages of history with over 676 different family biographies) plus 1897 Cooper County, Missouri Plat Map Book. An important resource for the study and research of Cooper County, Missouri history (including the Civil War) and genealogy. A. A rare 1851 map that shows the area of Cooper County just 33 years after Cooper County was formed. This 65 page plat map book is in full color and at the original large format size. These maps show not only each of the cities and towns in Cooper County in 1897 but also each of the rural townships. Those who owned farm acreage in rural area are shown by name which makes it possible to pinpoint the location of where an individual family actually lived in 1897. This plat map book is a rare and valuable resource for genealogy and historical research in Cooper County, Missouri. This detailed (583 pages in all) book has an incredible amount of historical and genealogical information about Cooper County, Missouri from its earliest settlement up to 1883. This is an exact photo replica of all the pages pertaining to Cooper County, Missouri including all of the historical and family biographical information. Included are a total of more than 375 different family biographies. This two volume set starts with the earliest history history of Cooper County, Missouri and continues up to the year 1919. This rarely seen set includes 1167 pages with 676 family biographies which is valuable for genealogy research. These volumes also include 148 photographs of buildings and individuals. The cost for this CD containing all four sections described above is only $9.95 plus shipping, or only $6.95 as a digital download! A large amount of history and genealogy information for very little cost! 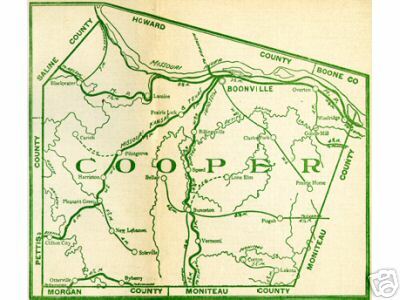 A truly fascinating view of Cooper County, Missouri from its first settlement to 1919. Since we offer many different county history and genealogy CDs, please be sure to specify that you wish to order the Cooper County, Missouri History, Genealogy and Maps CD. If ordering more than one, the shipping cost is $1.95 for the first CD plus only 25 cents shipping for each additional CD purchased.